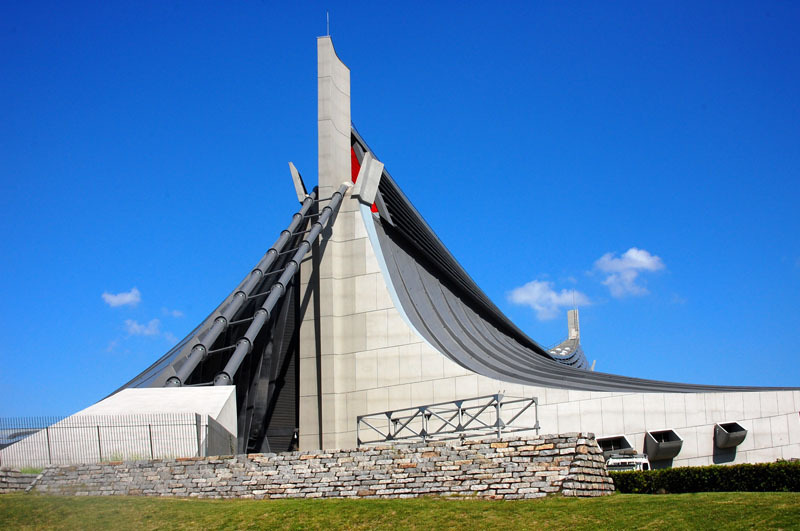 Kenzo Tange (1913-2005) was one of Japan's most prominent twentieth-century architects and the first Japanese winner of the prestigious Pritzger Prize, in 1987. 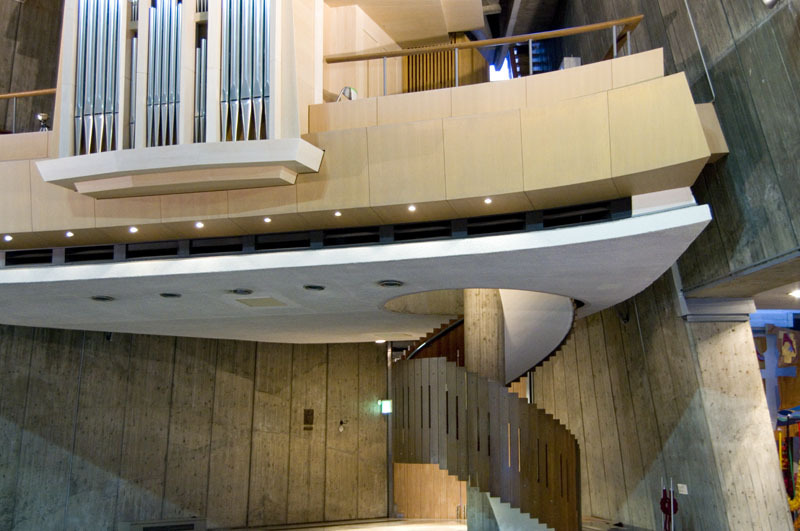 He was a founder of the avant-garde Metabolist group in the late 1950s, and as head of Tokyo University's Tange Laboratory during that period he had an enormous influence on subsequent generations of Japanese architects. 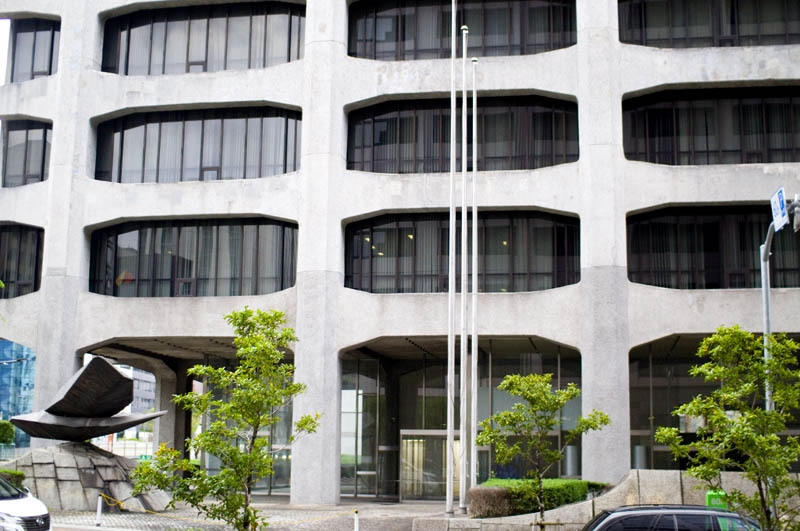 Although it has stood vacant since 2014, this was originally the headquarters building for Dentsu, then the world's largest advertising agency, from 1967 until 2002, after which it was occupied by a Dentsu subsidiary. 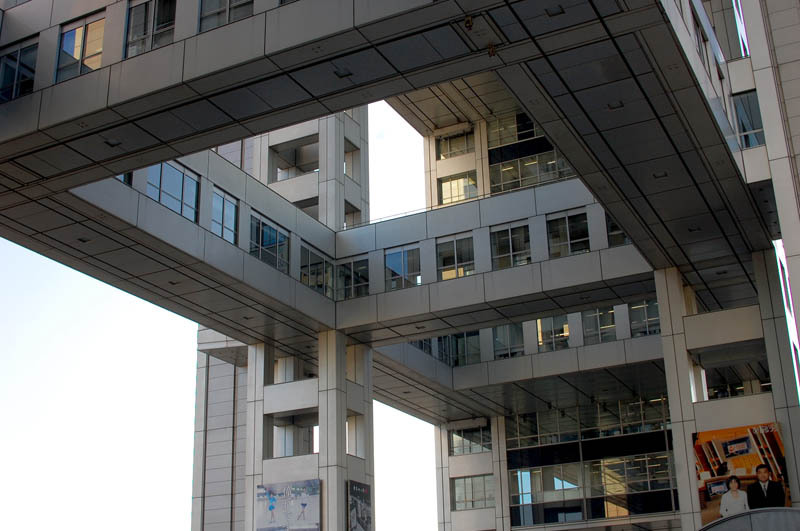 It was originally designed as part of a grand urban-planning scheme for the Tsukiji neighborhood, where a grid of high-rise buildings would be connected by elevated bridges. Unfortunately the original design was watered down quite a bit, and this was the only part of the master plan that was actually built. 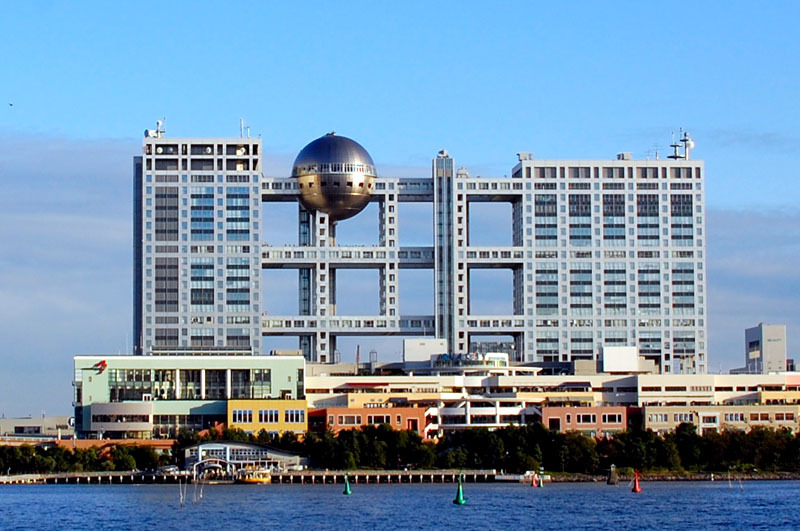 With its unusual silhouette, featuring a giant floating sphere and a skeletal central section of pedestrian bridges and columns, Fuji TV HQ quickly became a landmark of Tokyo Bay's Odaiba district. The silver-titanium ball is perched at a height of 100 meters above ground and houses an observation deck that's open to the public. 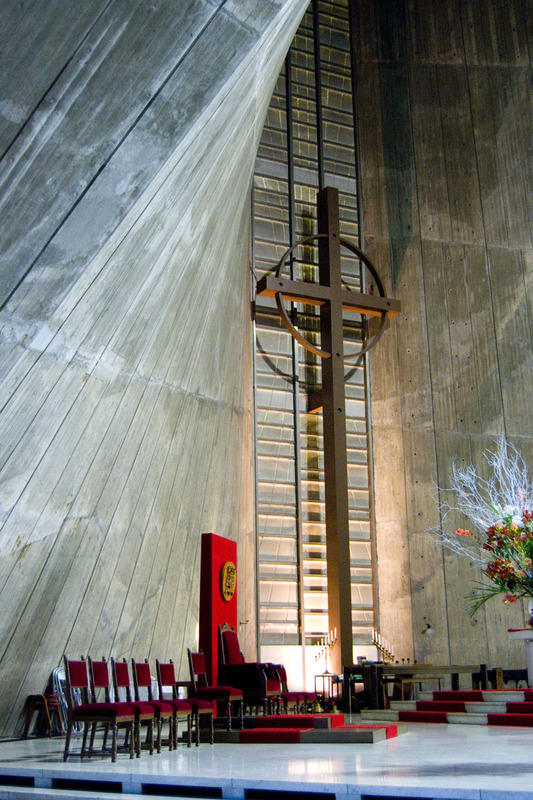 Construction was completed in 1996. 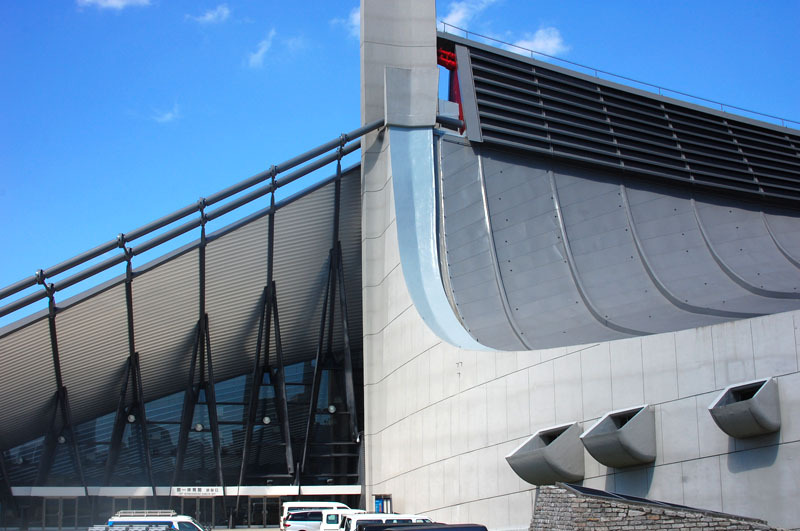 Built as one of the main arenas for the 1964 Tokyo Summer Olympics, this project brought Tange to international prominence. 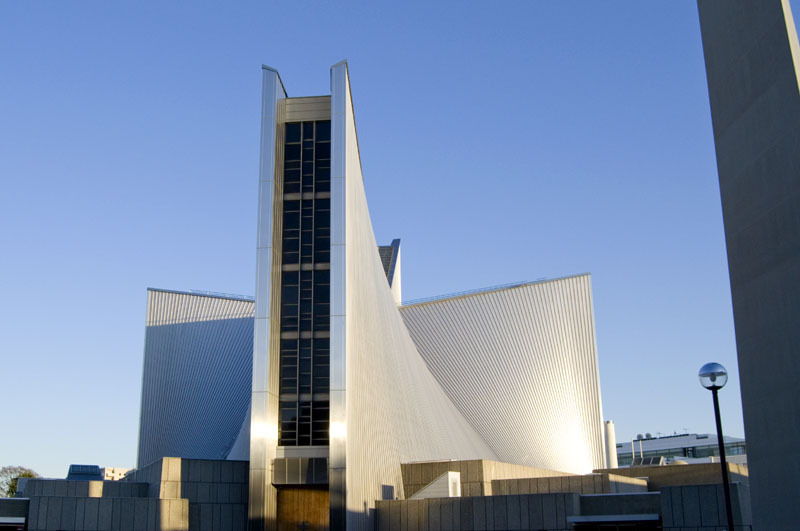 With its elegant, sweeping curves, the building has a light, aerodynamic quality in spite of its massive scale. 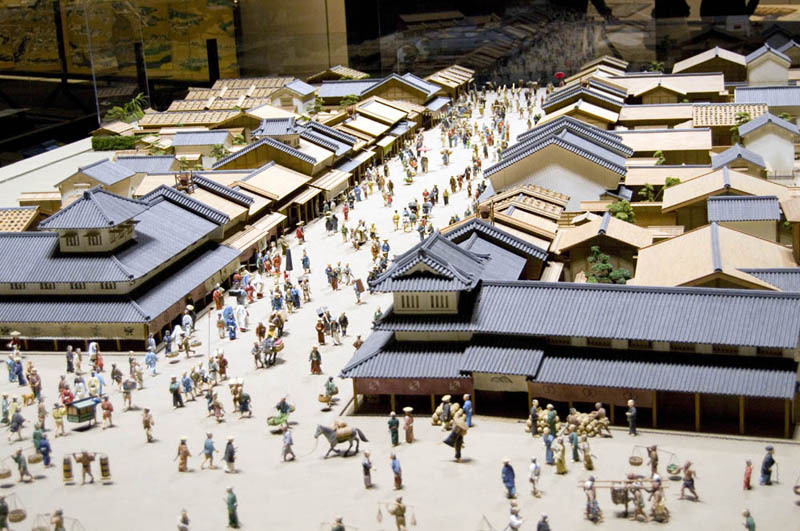 At the time of its completion it had the largest suspended roof in the world. 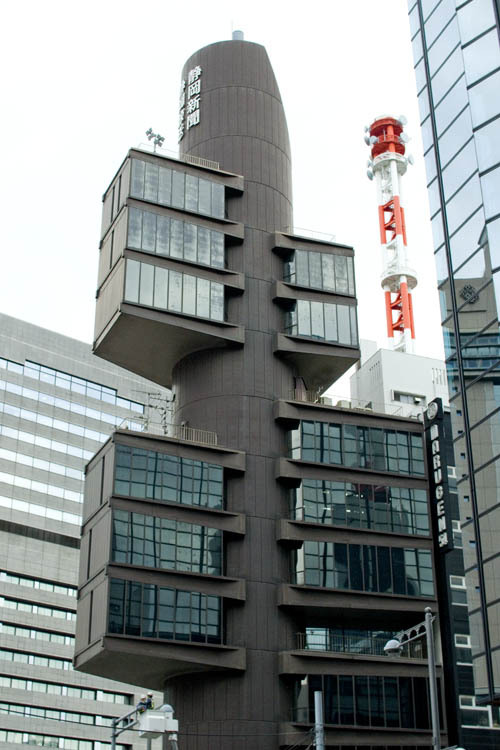 This early example of Metabolist architecture was completed in 1967 and occupies a prominent corner location near Shimbashi station. 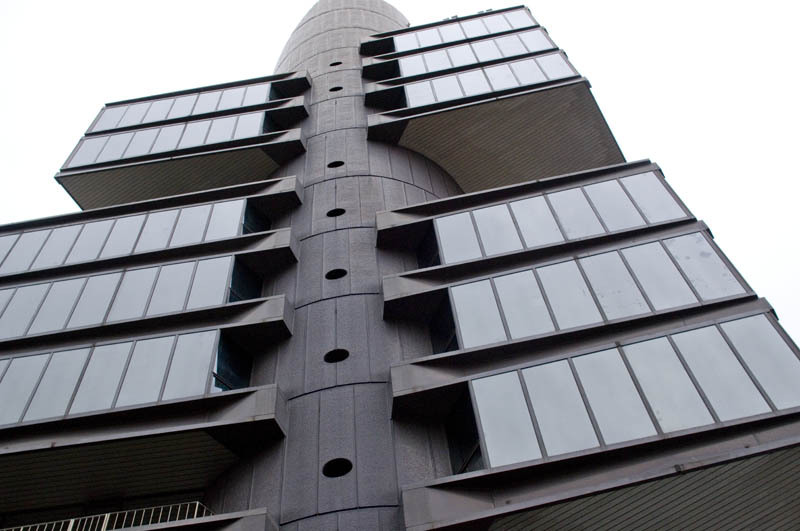 Built on a triangular site that's only 189 square meters in size, the building is constructed around a 7.7m-diameter cylindrical core containing elevators and stairways as well as kitchens and bathrooms on each floor. 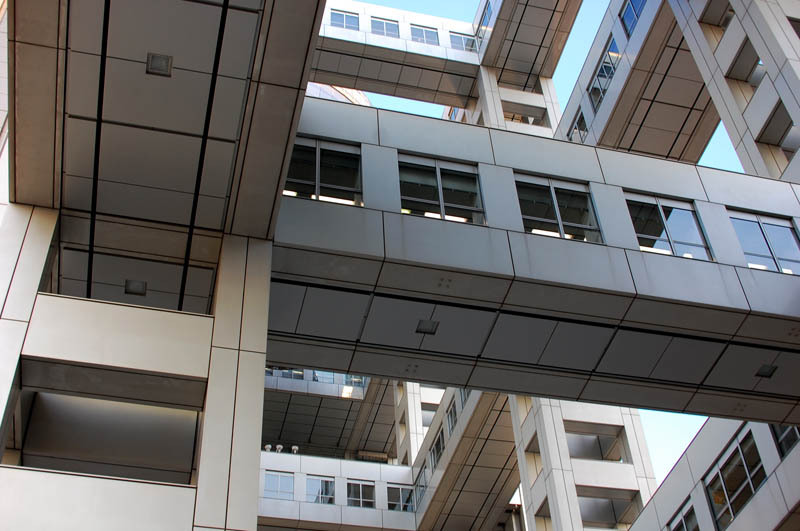 Individual cantilevered office units are attached to the core using giant bolts. 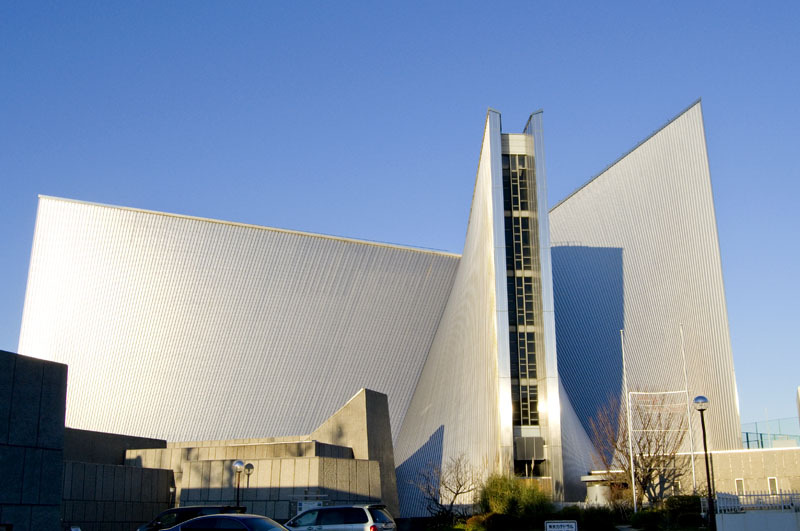 Completed in 1964 and designed around the same time as Yoyogi Gymnasium, St. Mary's also features swooping lines - eight parabolic curves that rise from the cross-shaped plan and serve as both roof and walls. The concrete structure is clad in stainless steel, reflecting sunlight in a changing pattern throughout the day. 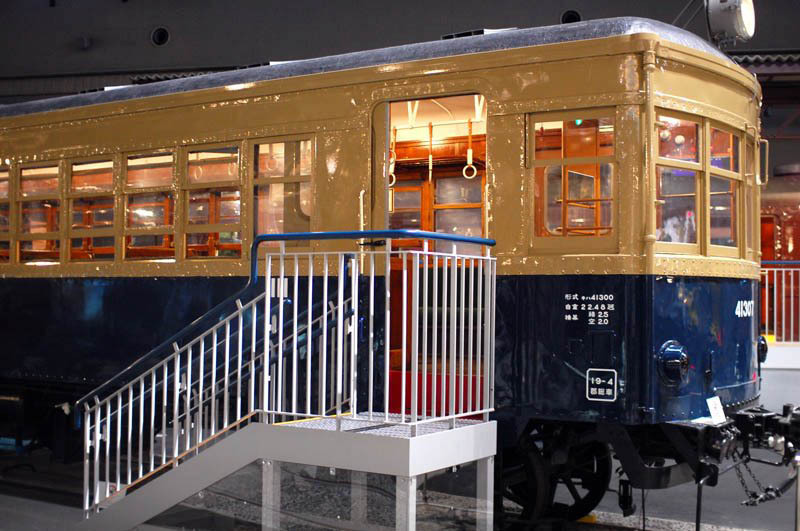 Where In Tokyo, your guide to fun things to do in the big city. 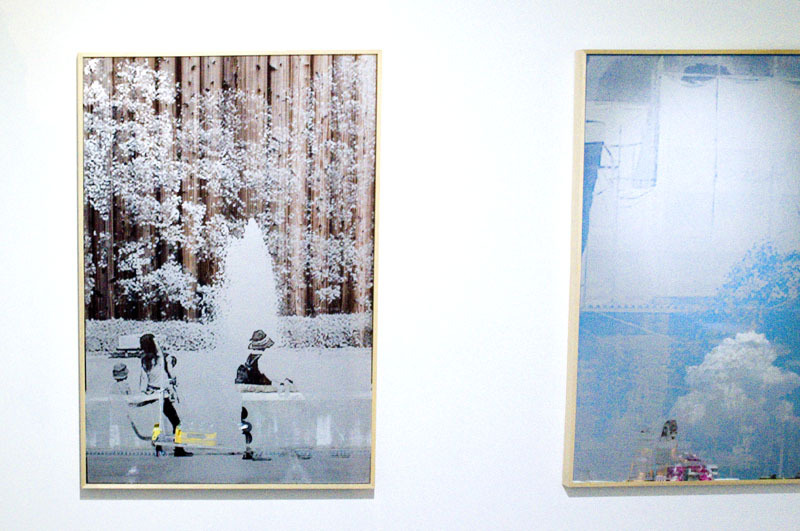 The Bakurocho neighborhood is home to Tokyo's most cutting-edge contemporary-art galleries. Here's a pick of our favorites, along with a few select cafes, lunch spots, beer bars, restaurants and other spots to visit. 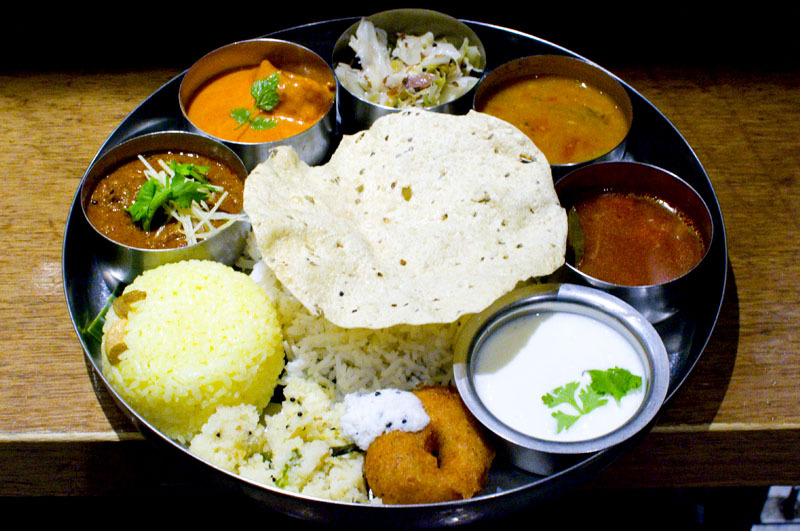 Judging by the lines at several of these South Indian restaurants, Tokyo folk can't get enough of the intense flavors and fragrant whole spices that characterize the cuisine. Here are some favorites. All those tiny people - where are they all going? What are their lives like? Here are some of the best places to ponder these important questions. 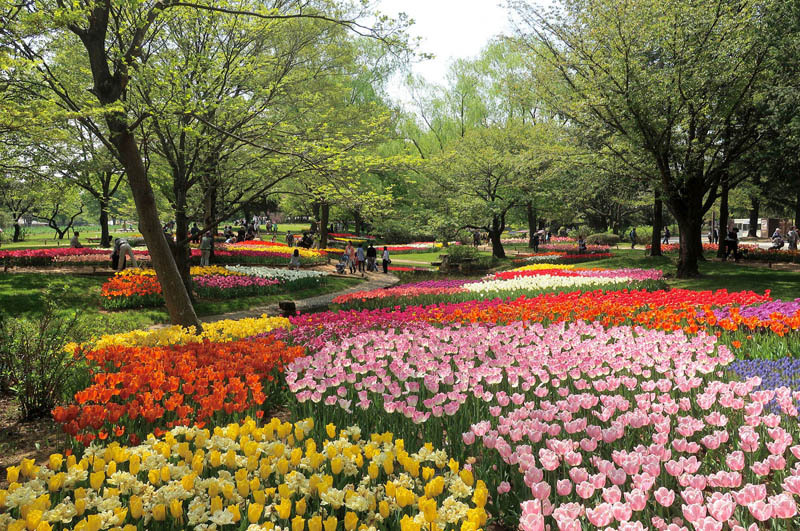 There's something in bloom in Tokyo every month of the year - if you know where to look. 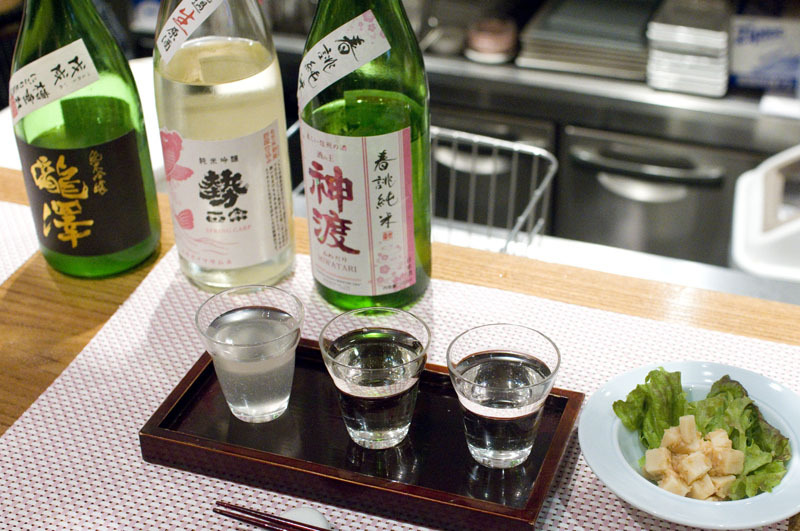 If you find yourself in Ginza with an hour to spare and you wouldn't mind trying out different styles of sake from all over Japan, we've got just the places for you. 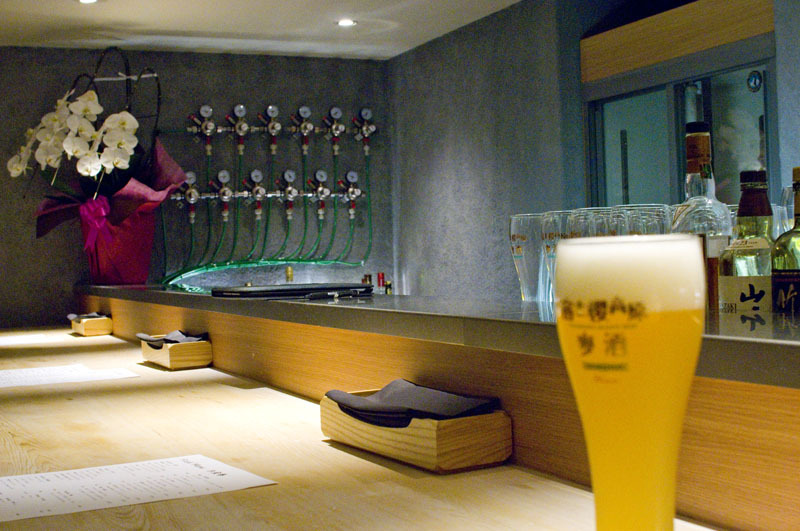 Tim Eustace introduces five Tokyo craft-beer restaurants and bars that serve very good beer and food, but aren't widely known or reported on. 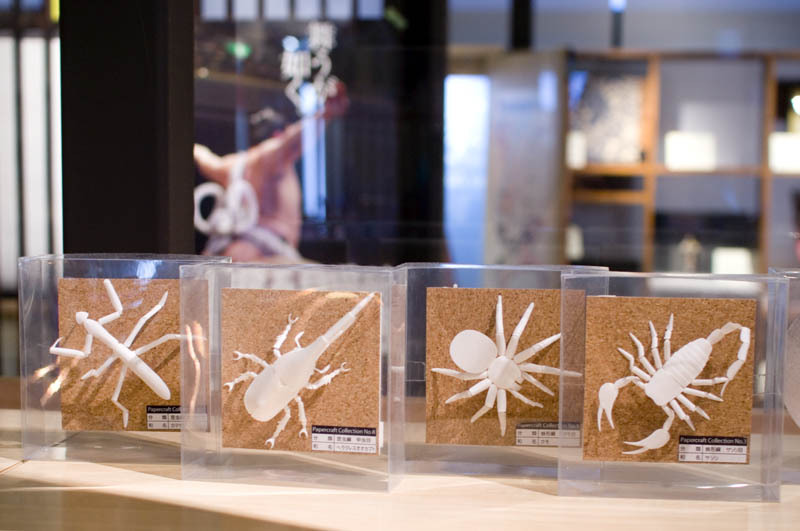 There's a lot more going on at Skytree than just the observation deck. And since it's all indoors, Skytree is a good all-day destination for when Tokyo is too hot, too cold or too rainy to spend time outside. 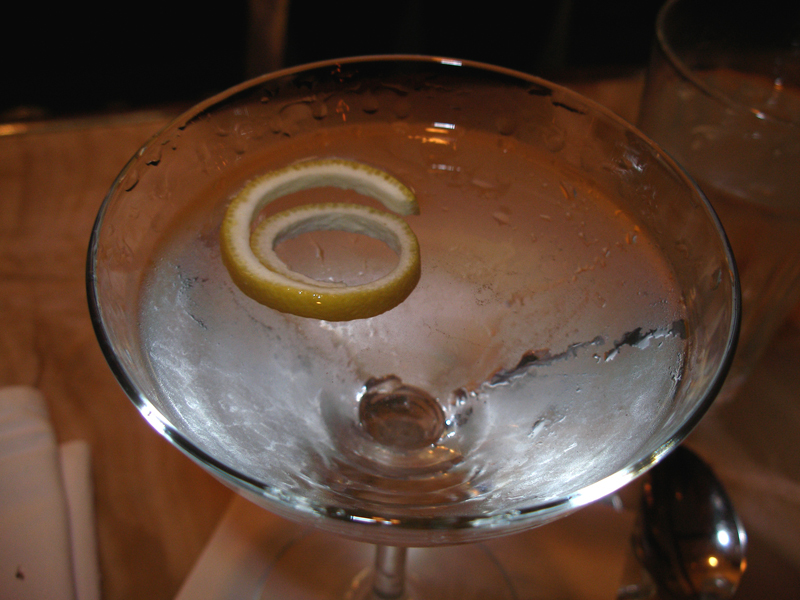 Cocktail connoisseur Ryo Seven recommends five Tokyo bars he likes to visit when he gets that martini itch. 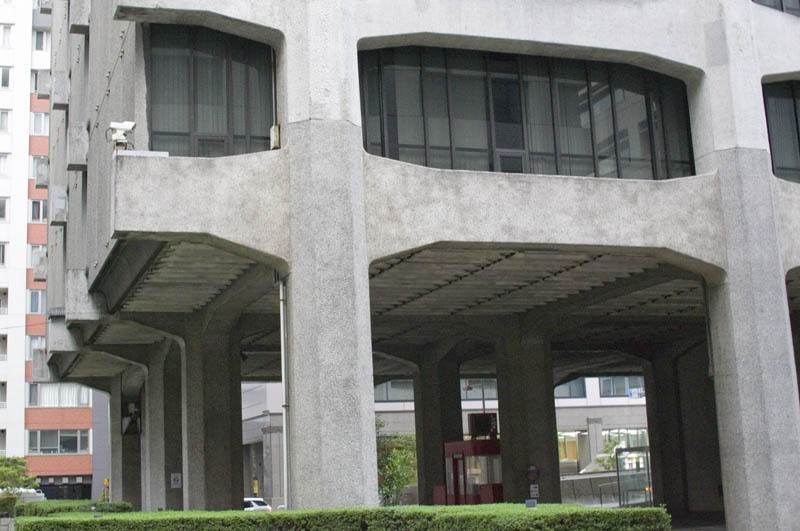 Our pick of the Tokyo buildings designed by Japan's most prominent 20th-century architect. 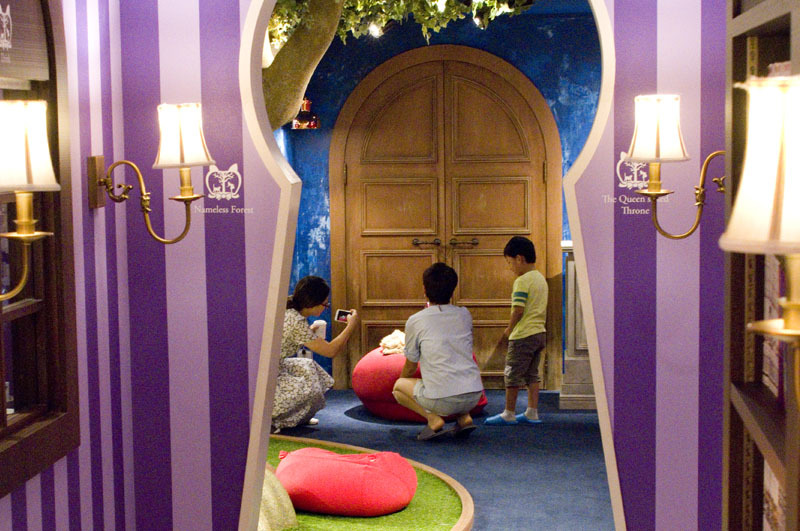 Many families visiting (or even living in) Tokyo are surprised to learn that most cat cafes don't allow young children. There are a number of exceptions though, so here is a guide to our favorite cat cafes for kids, broken down by age group. 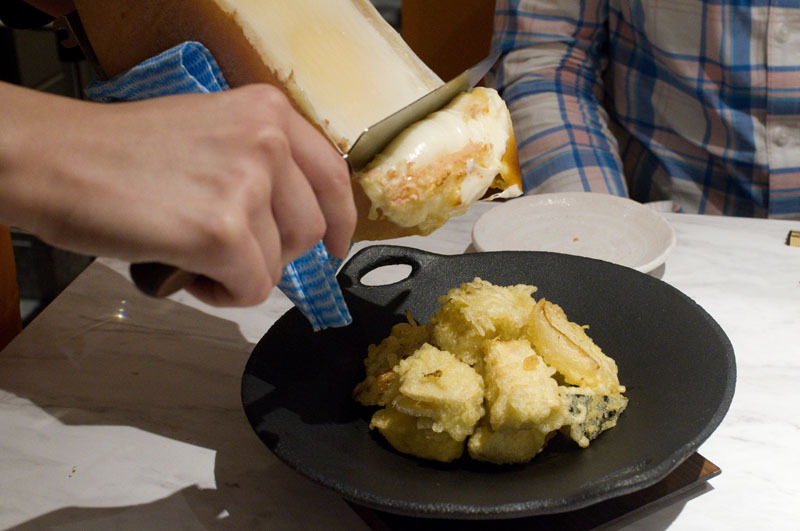 Once found almost exclusively in expense-account Swiss restaurants, cheese fondue, raclette and other cheesy delights are surging in popularity in Tokyo. Where are the best places to marvel at manta rays and hang out with penguins? 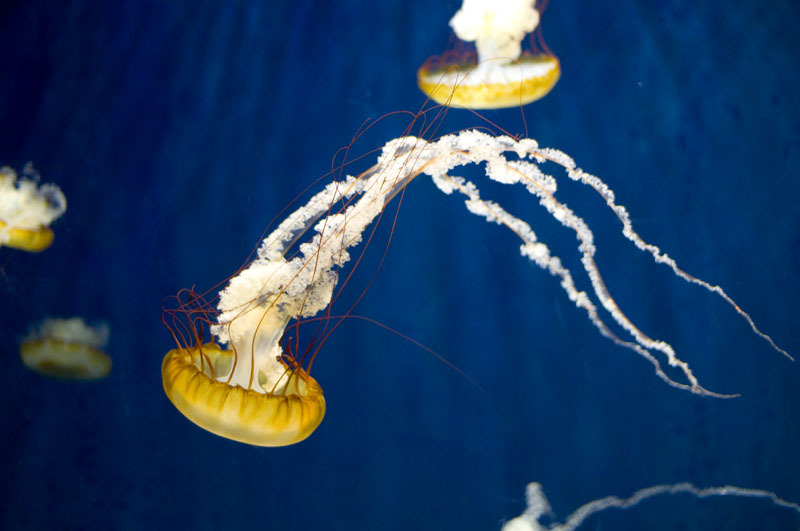 Here are aquarium picks for the metropolitan area. 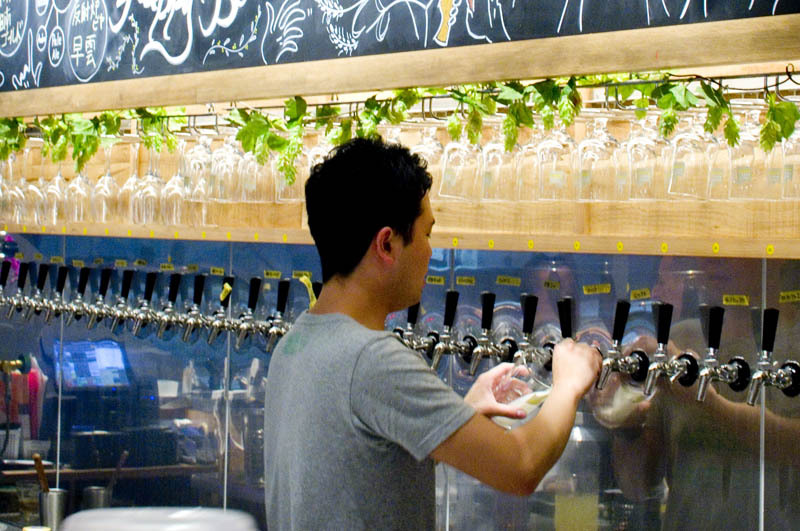 Although it's not especially fashionable, trendy or gourmet-conscious, somehow the Kanda neighborhood has turned into a major destination for craft-beer fans in Tokyo. Here's our guided (DIY) tour of 10 of the area's best bars. 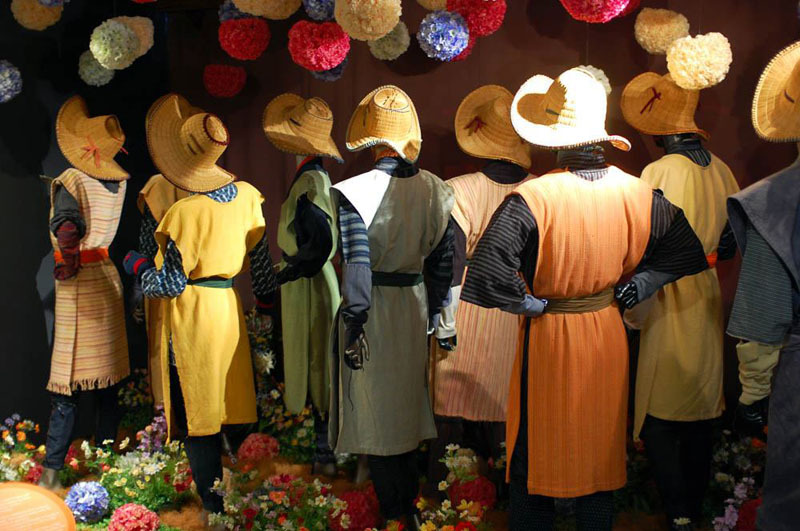 The Grutto Pass provides free admission to more than seventy museums and other attractions during a two-month period. Here's a map of all of them, plus recommendations for some favorite spots. 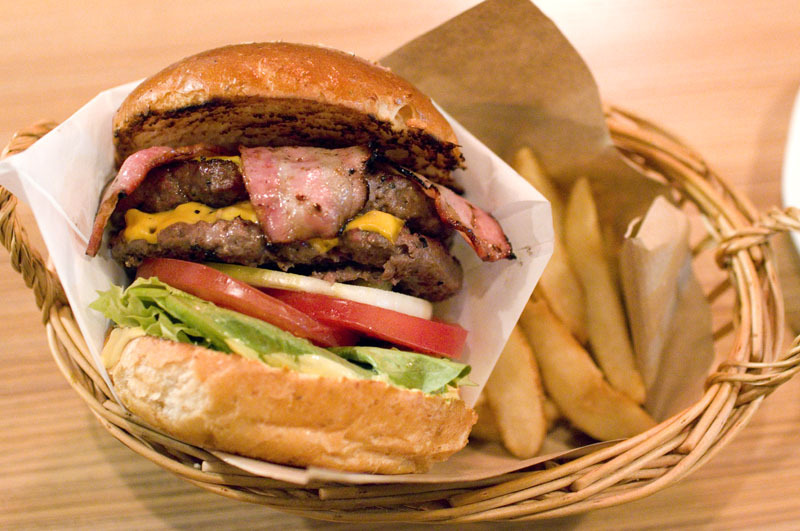 Gourmet hamburgers are everywhere in Tokyo these days, but where do you go to find the meatiest, juiciest patties in town? Here's a rundown of a few of our favorites. Train simulators, room-size train layouts, vintage uniforms and full-size locomotives - where are the best places for train buffs to indulge?